So here we are, the holidays are over and the New Year is right in front of us. How on earth does time fly by so fast? 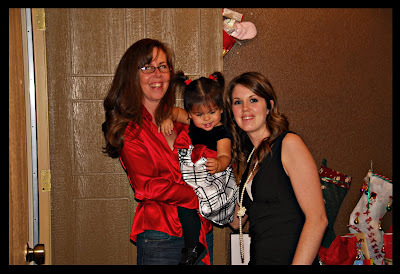 I figured I would share a little bit about Christmas with Monkey and the family this year. . . This is Monkey on Christmas Eve at my MIL's house. There were about 30 people there and she totally held her own in that crowd! 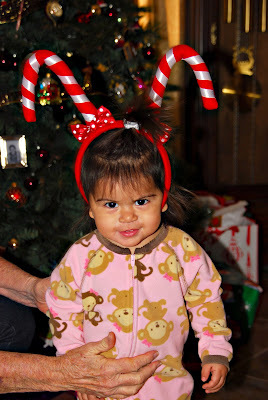 She was all smiles and a little bit of mischief all evening! 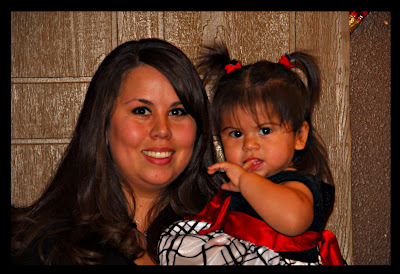 This past week I realized that in the first 16 months of Monkey's life there are only 15 photos of me with her! So I have made a goal to get even more of us together this year. 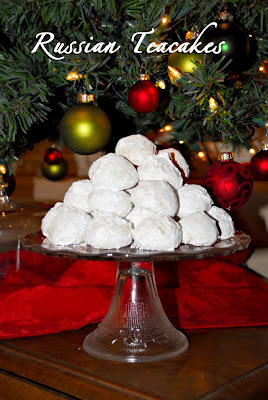 I started on Christmas Eve and got about 6! Here is one of my favorites! 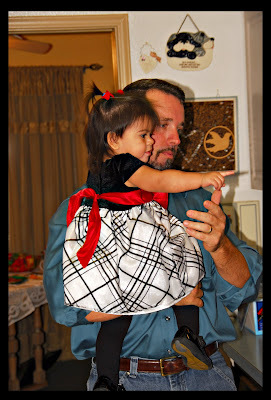 She is playing this new game with Uncle Larry - not allowing her to hold her! It is really quite funny. But I was wanting a photo of them together - this is the best we could do. 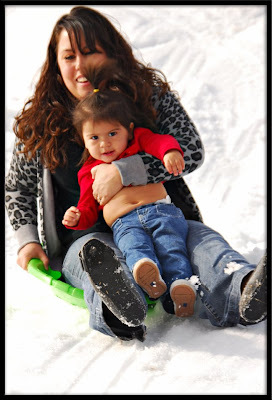 How sweet is this photo of Mommy & Monkey together! No posed pictures with Grampa - but I did get a couple of them checking things out. 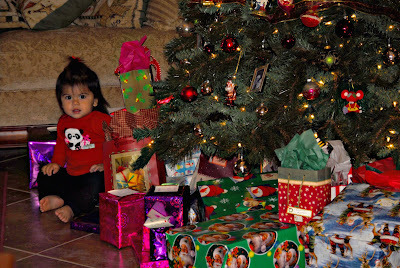 Now we are at our house on Christmas Morning. This was not the super great Christmas I was hoping for. It was a cold and rainy day so we were all stuck inside. And if that was not enough, Gary woke up with a terrible case of the stomach flu! Poor baby could not even open all of his gifts. He was broken hearted that he had to miss this special time with Monkey. But it was best for everyone that he be back in the bedroom away from everyone. Still, Monkey and the family really enjoyed their day and their gifts. 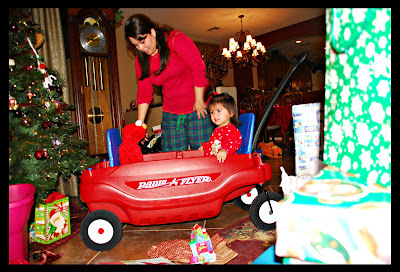 This is Monkey and Mommy with her new wagon and Elmo Live. 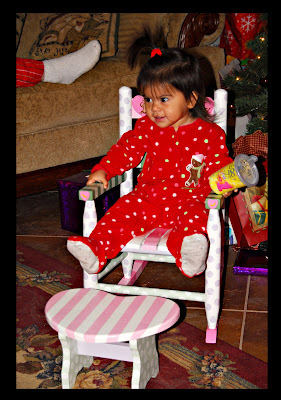 Here is my Monkey in her new rocker - thankfully she loved it! Gary got me the sweetest gift this year. It actually even brought a tear to my eyes. He bought me a beautiful pendant with Monkey's birthstone and a diamond on it. It was just so thoughtful and sweet of him. I never would have imagined him thinking of that for me. He says I will get a new one with every new grandbaby! The girls need to have babies in April - that is the diamond month! Today Gary is finally up out of bed - still feeling a little yucky, but over all much better. I have been busy cleaning the house. If you didn't know this already about me, I am a total grem-a-phob! So it is smelling of bleach and Lysol in my house today. And even though it is cold out today the windows are open to try to blow it all out. Hopefully I am successful and no one else in the family will get sick! I hope you all had a wonderful Christmas and that you spent it with those you love. For our friends and family that we did not get to spend Christmas with, know you were with us in our hearts this year! Well, it's finally here! We will be leaving the house in an hour or so for Gary's Mom's house to celebrate Christmas Eve with all of his family. It is a BIG crowd, about 30 of us when we all get together. We have Monkey with us today since her poor Mommy & Daddy had to work. 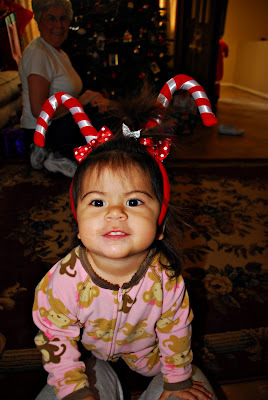 It has been a long time since I have had to get a little one ready for the holidays. I hope she will be up for letting me get her hair down and putting tights and a taffeta dress on her! Tomorrow we will celebrate here at our house with our girls, Darwin, Monkey and my Mom. 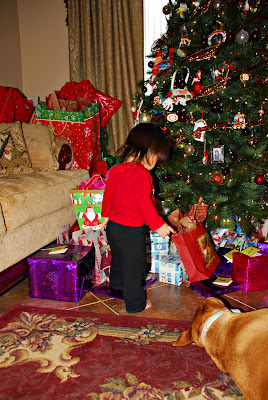 It will be so much FUN to watch Monkey with all of her presents! I hope you all are enjoying your holiday and your family!!! 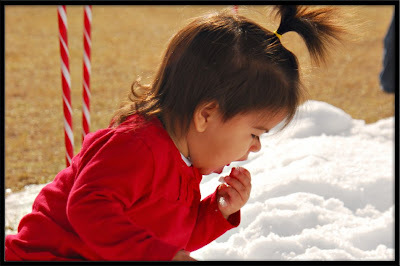 Here are a few photos from yesterday to help put you in the holiday spirit! it will be ALL OVER! 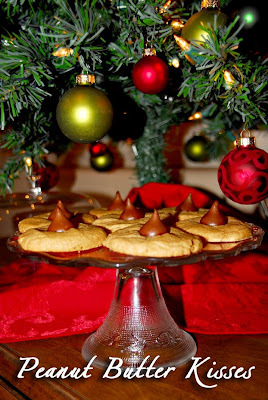 Christmas will just be a sweet memory by this time next week. Are you all set? I think I am - what's not done I guess wont get done. I hope you are all enjoying the season and your family. After all, that is more important than the shopping and all of the little details. It's been 9 days since I last popped in to say hi. It has been a hectic 9 days and that is why. Let's see, what's been going on around here. 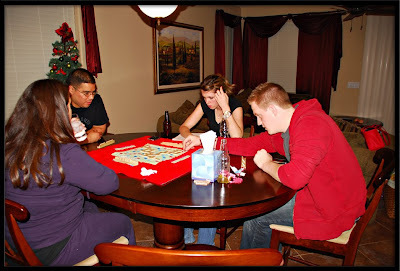 . .
Then it was back to the house with the menfolk (Gary, Darwin & Richard) and Monkey for dinner and games. We played some scrabble and Cranium and Lizzy picked lemon peppered chicken and Red Bread for her birthday dinner. Gary made up for the past with a certain present. . . A "My Size Barbie". Lizzy always wanted one as a little girl and never got one - thatis until her 20th Bday! 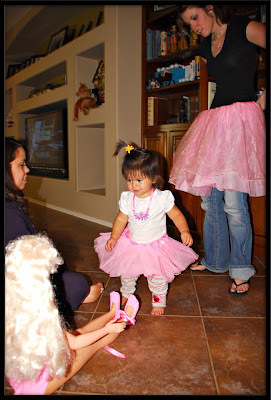 Lizzy and Monkey had great fun wearing Barbie's tu-tu's. Lizzy even went to the grocery store with my Mom in hers! Ya gotta love Liz! She is just so FUN!!!!! My Monkey has continued to be sick all week too. Poor baby, between the cold, the teething of more molars and the addition of an ear infection she has NOT been a happy girl! I must admit that it is very tireing for me when she is sick too. 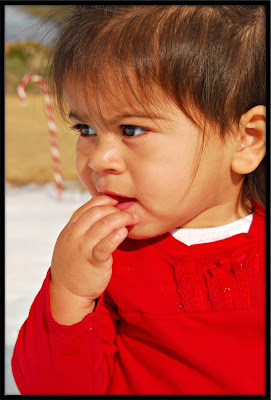 Since she has been sick we have not been able to get a Christmas photo for B&D's Christmas cards. Last year we had a ton of them by now! 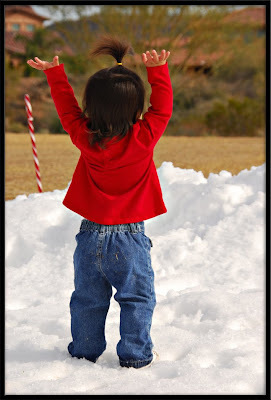 Saturday they delivered "snow" out here in our community. 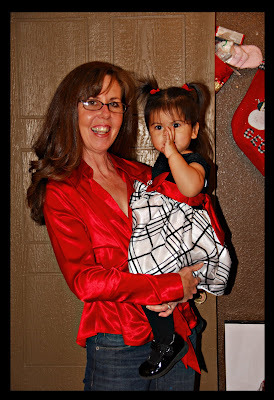 I kept Monkey over night while B&D went to a Christmas party. 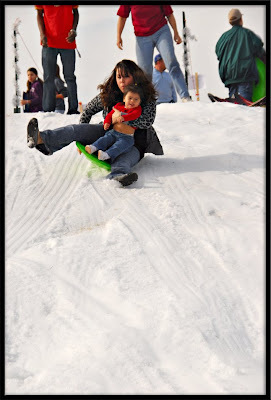 So the plan was to take Monkey to the "snow" Saturday morning before she went home. 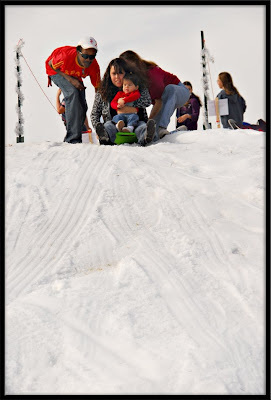 We were hoping that we would get a "card worthy" photo at the snow. I think we did it! 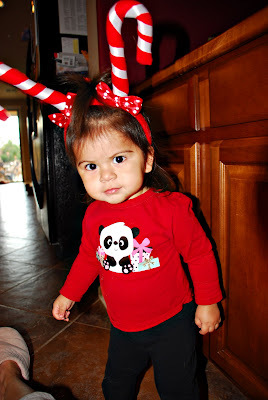 There are 100+ photos for Bryanna to pick from - here are just a few cute ones I liked. . . 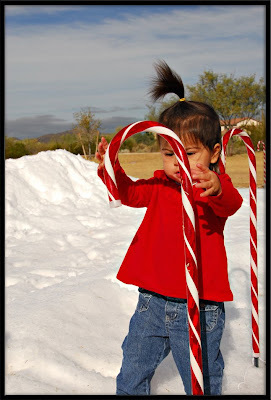 So, this is how we in AZ get a "White Christmas". * And it goes away with no mess or stress! But like I always say - we have an "AUTHENTIC" Christmas here in the desert. After all there was NO snow in Bethlehem the night Christ was born! 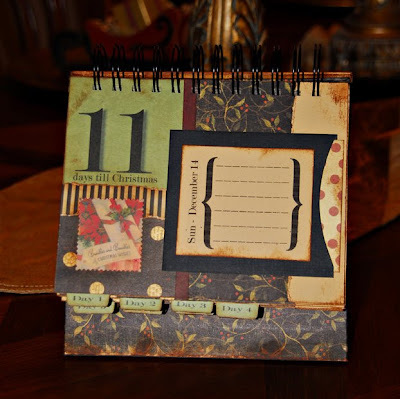 Tonight is the 1st night I get to write in my Christmas Journal that I made. 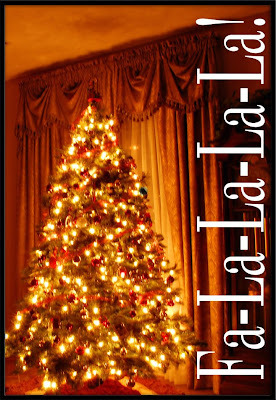 It's only ELEVEN DAYS UNTIL CHRISTMAS NOW!!!! I don't have a ton of interesting stuff to write today. I seemed to be in a fog most of the day. 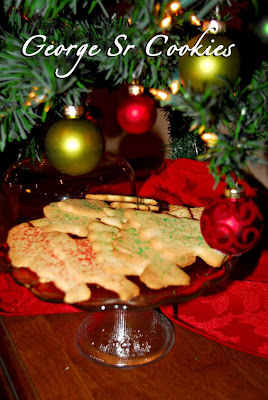 But the pressure of knowing I had to start writing in my journal made me get off my duff (after editing all of the snow pix) and get the Christmas baking done! I also got some magic cookie bars done, But they didn't get out of the oven until after I started typing. The banana bread is all done too, so if I don't get anything else made I will be alright with it. It has been a long, hard week and I am hoping that this coming week will be better and put me back in the Christmas spirit. I have alot to get done this week. Cleaning, a hair cut, the Post Office (ugh) and 2 parties. One of which we are hosting here at the house on Friday for all of Gary's work! I hope you guys are all having a great time and enjoying the season. The Ups & Downs of the day. . . 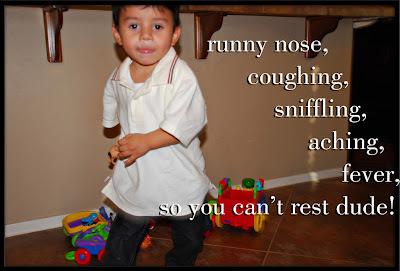 When you are 16 months old & sick! So life was pretty good this morning. The nose is runny and you can tell Monkey still isn't herself but she is able to play and have some fun. Uncle Larry came in with some more Leggo art for her. 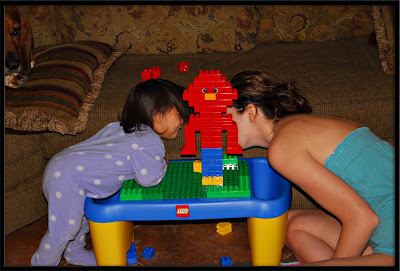 Monkey LOVES Elmo - so while she was watching Elmo on TV, Lizzy made a Leggo Elmo! Monkey was thrilled with it! She was especially excited that Elmo had eyes on the back of his head as well and couldn't stop looking back there. Eventually she was too tired to play anymore and it was time to go down for a nap. Time to get up - Naptime is over - and it's lunch time and bath time - always good times!!! 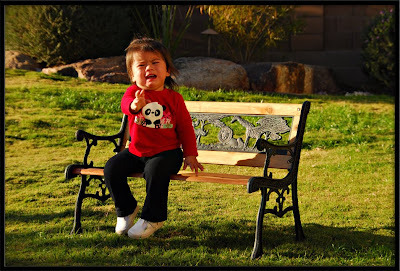 Playing outside and having fun until G-Nana suggests I take some pictures of her playing on her bench. That brought on one of those "I'm sick, leave me alone" meltdowns! I am a bad Gramie and had to get some of these tears "on film". It is rarely that this happens that I just had to. I had to get down to get to the "UP". I got down on the ground with her (and my camera) and let her take some pictures. I actually took this one of us together. But she was thrilled by it. 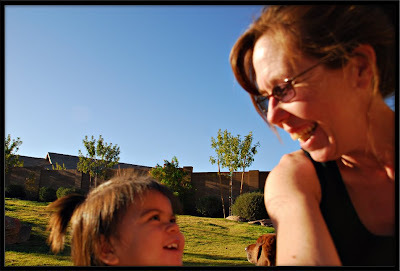 She loved that the camera was pointed at us both and I got a great smile, even if I did cut off part of her chin! But these next ones are ALL HERS! I only held the camera. She pointed it and and looked through the viewfinder and pushed the button. I am very impressed at the images she captured. Especially the ones of G-Nana! 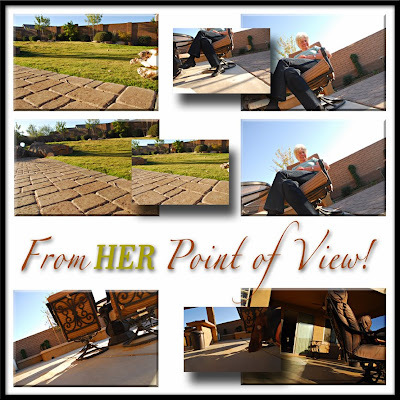 When I edited the pictures (just for sharpness) I realized how different the world is from her point of view. Be sure to look at the bigger version of these - it is kinda fun! Well, even though Monkey is still not feeling quite up to par yet, she was willing to play and enjoy the day. Most of it anyway. 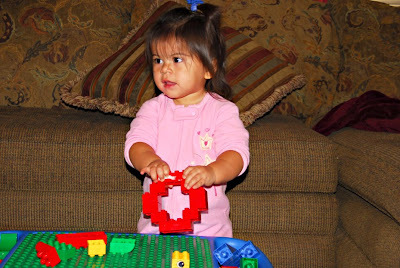 Before Uncle Larry went to school this morning she took some time out to play leggos with her. Monkey's attention span is just slightly shorter than Liz's and ended up playing something else. 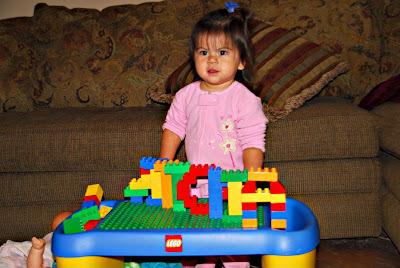 This left Lizzy lost in the joy we all know as Leggos. I was quite impressed when I walked away from doing the dishes and found what Lizzy had created. I had to go back and get my camera. 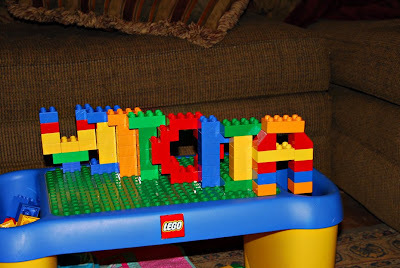 I have never thought of doing letters with Leggos - pretty cool and colorful! I of course wanted to get a picture of Monkey with her name. I of course forgot the Leggo rule. 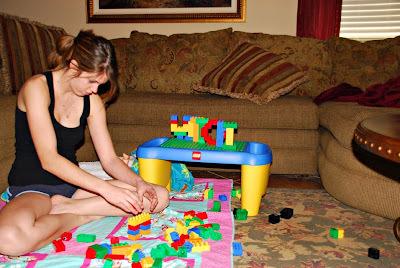 . .
when you create something with Leggos a 16 month old MUST destroy it! No matter - it was fun while it lasted. And I caught it on "film" to remember it with! After a nap I thought she might enjoy coloring for a bit. 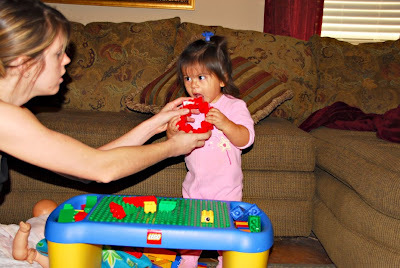 Mind you, she is not feeling great and so everything is an effort, so an activity that doesn't require a lot of movement is a good thing. 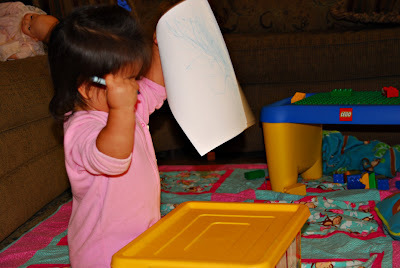 Look at her showing off her masterpiece. It is of course hanging on the refrigerator for all to admire. 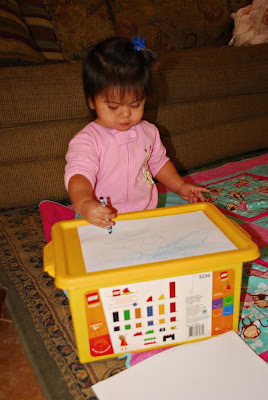 After awhile the white paper ceased to hold her interest and coloring on the Leggo tub and the tile was what made her happy. But it didn't make me too happy - mostly because Grandpa is a stickler about that stuff. 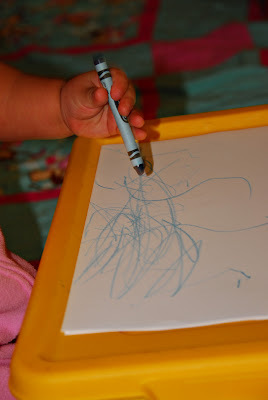 So I had to confiscate the offending crayon. I hope yours was just as colorful! Well it's been almost a week since Thanksgiving and I am just now getting around to making a post. It is amazing how time can just get away from you. This 1st photo is of B&D's nephew that came to town from Northern Calif for the holiday. He brought a very special gift with him, and was so generous as to share it with Monkey and I! That's right, This little sweetie coughed and hacked and had a runing nose all day. Bless Bryanna's heart she got to take him home with her for the whole weekend (more about that later). So this is one of the reasons I am so late in making my Thanksgiving Day post. I think I already told you that we were hosting Thanksgiving dinner at our house this year. And we were including Darwin's sister's family from Calif. Feeling oh so proud of myself, I had the table all set and ready for company ahead of time. We would all be sitting in the dinning room and I bought a small child's folding table to seat the 2 little boys. About 9pm on Wed I got a phone call from Bryanna - we would be having 6 more family members of Darwin's for dinner. No sweat! That is why we bought this big house after living in a tiny house the whole time we were raising our kids. I actually felt blessed with the news of more family. It was my vision of a full house at the holidays here and this holiday would be full! So I pulled out the leaf on the other table, washed a few more pieces of china and added an extra placesetting to the kids folding table. Viola! We were all set once again! Thanksgiving Day was wet and kinda dreary - the 1st Thanksgiving in 20 years that we had rain in Phx. But that is better than the Thanksgivings we had in the past at 90+ degrees! 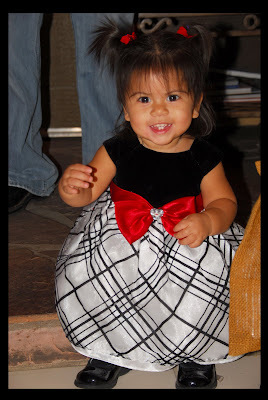 When Monkey arrived I was trying my best to get a photo of her in her dress I got her - she was having NO part of that! 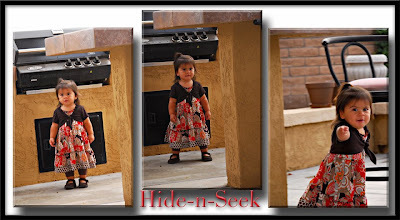 Instead she insisted on a game of hide-n-seek on the patio around the bar. I am really glad she did, these are some of my most favorite pictures from the day! Can you even believe how stinkin' CUTE she is!!!!! I am truly thankful to have her in my life! We were a little late getting dinner on the table this year. But it was just okay. Everybody seemed to find something to do and some place to hang out while my Mother was busy in the kitchen. (remember, I hurt my arm and so I really did none of the cooking this year - I left that job to my 73 yo Mother!) The guys were out back playing darts and smoking cigars. The kids were inside playing and running crazy (making my Mom about crazy too) and the woman were just visiting, while I ran from area to area with my camera. Eventually grace was said and everyone helped themselves to a big plate of tradional Thanksgiving food. I had a hard time getting a picture of everyone at the table at once. And once everyone was sitting down I was too, and shoving my face full of noodles and other goodies! Monkey seemed to enjoy her plate, and it's a good thing she can feed herself now so that her Mom could start eating too! 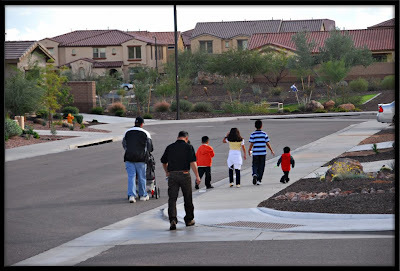 Once dinner was done Gary got all of the kids ready and took them all on walk to one of the parks in our community. The other men decided to go too (except for one) so the women all stayed in and poured over the Black Friday ads in the paper. Being as how all of my shopping is done (bragging here) I opted to do the dishes. Another great thing about our new house is that I can do that and still be part of whats going on. All of the living area in our house is all pretty much open and visable. They got home from the park just in time before the rains returned. 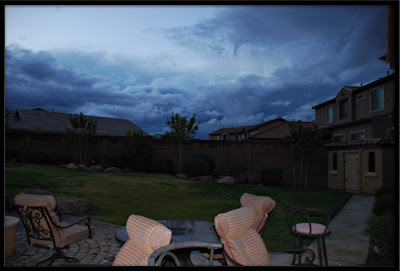 The sky was amazing right before the rain and I of course had to go out and take some pictures. By now little Jonathon is really sick and coughing and so I ran his Mom to Walmart to get some cough syrup so they wouldn't have to stop in the rain with all of the kids. By the time we got back it was pouring! Monkey was cranky, Jonathon was sick and it was time to call it a day. Gary said he'd drive the kids and the caravan out of Vistancia began! Of course in typical Marta style, I broke out the bleach and the Lysol to kill the bug that had been left behind in my house (it didn't work). VIOLA!!!!! We got it all finished and it was stunning! Another Thanksgiving Day has come and gone and I have even more to be thankful for this year than I did last year!!! How about you?